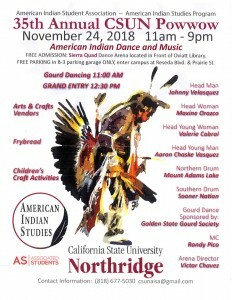 A California State University, Northridge tradition that began in the 1970s – and one that has been a tradition in American Indian communities for generations – is celebrating its 35th anniversary on Nov. 24. CSUN’s American Indian Studies program and American Indian Student Association will host its 35th annual Powwow – which includes American Indian dance and music – from 11 a.m. to 9 p.m. in the Sierra Quad located in front of the Delmar T. Oviatt Library in the center of the campus at 18111 Nordhoff St. in Northridge. Gourd dancing, which is a formal ceremonial event, will launch the celebration at 11 a.m. Grand Entry, which is a prelude of all the day’s dancers and will take place at 12:30 p.m. The opening ceremonies, such as the blessing, immediately follow the Grand Entry. Grand Entry will include representatives of the Fernandeño Tataviam Band of Mission Indians, who are the native people of the San Fernando Valley. CSUN is built on Tataviam land, Andrews said. The Powwow will include “25 to 50 dancers” who will be wearing special regalia – which is traditional clothing appropriate for different dance styles. Andrews said the regalia highlight the mixture of traditions and contemporary experience. The long-established features, such as feathers and beadwork, are mixed with contemporary influences such as neon colors. Many American Indian regalia, which is considered traditional, now mix contemporary themes including, “neon colors which do not occur in nature.” Andrews said that showcases the modernity of American Indian people. For some intertribal dances, audience members are welcome to participate, and regalia is not required. The Powwow will feature vendors selling items from souvenirs to fine arts, a raffle, traditional American Indian foods and a children’s activity table featuring history and botany of native plants in California. arking lot. To access B-3, enter Prairie St. from Reseda at Blvd. For more information contact CSUN American Indian Studies program at (818) 677 – 5030 or csunaia@gmail.com.